Both of Canada’s major railways announced results for the period ended December 31, and both were able to produce revenue growth well in excess of the growth rate of the economy. 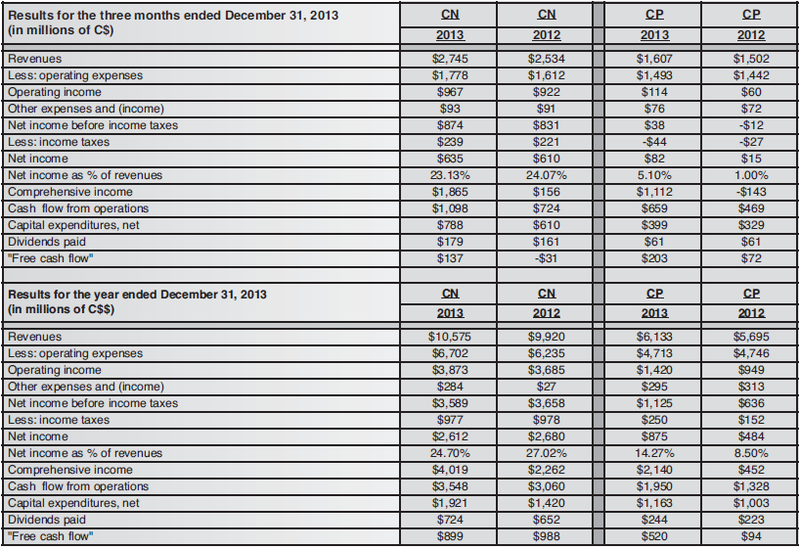 During the quarter, CN’s revenues rose 8.3 per cent to $2.745 billion, compared to the fourth quarter of 2012. Even though operating expenses as a percentage of revenues rose from 63.6 per cent to 64.7 per cent, operating income increased by 4.9 per cent. Cash flow from operations increased to $1.098 billion from $724 million. “Free” cash flow, the amount remaining from operating cash flow after subtracting net investments made during the quarter and dividends paid to investors, rose to $137 million from a negative $31 million. 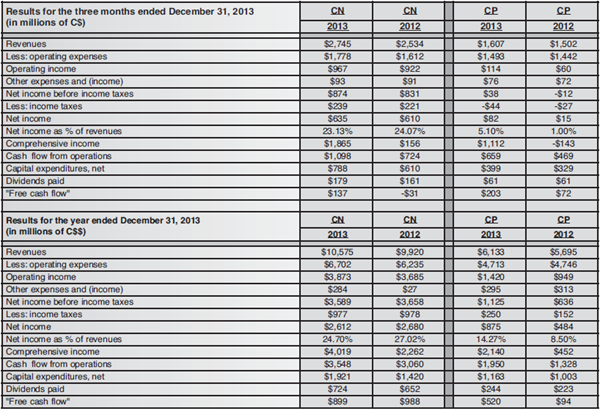 CP’s revenues rose to $1.607 billion during the quarter, up 7.0 per cent compared to the fourth quarter of 2012. Operating expenses declined significantly from 96.0 per cent of revenues during the fourth quarter of 2012 to 92.9 per cent during the third quarter of 2013. As a result of higher revenues and lower expense levels, operating income increased to $114 million, up significantly from $60 million during the fourth quarter of 2012. Cash flow from operations rose sharply from $469 million during the fourth quarter of 2012 to $659 million during the quarter just ended. For CN, the bright spot continued to be petroleum and chemicals, which produced the largest revenue gains during the quarter (22 per cent). Freight revenue per revenue tonne mile, number of carloads, and revenue tonne miles achieved for that category showed strong gains compared to the fourth quarter of 2012. At $3,264 per carload, revenues per carload from carrying petroleum and chemical products were the highest of any category, and were up by 15 per cent compared to the fourth quarter of 2012. CN’s most important revenue generator continues to be Intermodal, with fourth quarter revenues of $555 million, up 11 per cent from 2012. Overall carloads were up by three per cent, and freight revenues per carload were up by six per cent. For CP, the bright spots were industrial and consumer products (particularly crude oil), and grain, with quarterly revenues rising by 22 and 11 per cent respectively. Industrial and consumer products revenue tonne miles rose by 24 per cent, although freight revenue per revenue tonne mile for that category fell by two per cent. Freight revenue per revenue tonne mile grew strongly for forest products (9 per cent) and grain (8 per cent). Overall, revenue tonne miles rose by seven per cent, but freight revenue per revenue tonne mile rose by only one per cent. Total carloads were up by one per cent, but freight revenues per carload were up by seven per cent. During the quarter and the year, CP continued to make efficiency improvements, particularly in locomotive productivity, average train weight and length, fuel efficiency and the size of its workforce. For the year, increased productivity, coupled with increases in revenues per carload while maintaining strict cost control led to record operating results at CP. For its part, CN’s unit operating expenses were under pressure during the year, as evidenced by an increase in its operating ratio, from 62.8 to 63.3 per cent. CN has been using its strong cash flow to make substantial investments in capacity and efficiency, having increased its capital spending since 2011 by more than 50 per cent. CN intends to maintain this pace in 2014 with planned capital expenditures of about $2.1 billion. During the year, CP’s operating ratio, defined as a company’s operating expenses as a percentage of its net sales, improved dramatically by 6.48 percentage points to 76.8 per cent. As a result of achieving significant operating cost reductions, CP’s net income and cash flow from operations increased to record levels.